Petrol stations are expensive, smelly, cold and unpleasant most of the time, aren’t they? In an ideal world, we would all spend as little time on the forecourts as possible. So, as the motor industry turns increasingly greener we’re bringing you the 10 plug-in hybrid cars that can go the furthest without using a drop of fuel. We’ll list the MPGs of each car too, as well as the price, and hopefully, you’ll find a car that will keep you away from the fuel stations for as long as possible. This will be one that strikes up interest from company buyers, for sure. The 530e SE model of the BMW 5 Series offers the most popular package for premium saloon buyers who don’t want to stray too far from their comfort zone when moving over to a hybrid. The 530e is priced from £43,985, which is roughly what buyers should expect, but it is also due to be replaced in 2018 under the new ‘iPerformance’ name tag, which means now is a great time to get the current model as dealers are likely to be open to negotiation. A hybrid version of one of the worlds most adored hatchbacks was always going to sell well, wasn’t it? Well, apparently too well. Head to Volkswagens website to find out information about the GTE and you’ll be greeted with a message reading ‘Due to unprecedented demand, leading to long delivery lead times, we are temporarily closing Golf GTE to order.‘ Who would have thought that a VW Golf with a claimed MPG of over 150 and an EV-only range in excess of 30 miles would sell so well? All of us, really. Still, let your dealer know you’re interested and get on that waiting list. Can a hybrid be fast, economical, desirable, practical and relatively affordable? Yes. Introducing the V60 twin engine. With a 0-60mph sprint time of just 5.8 seconds, it’s certainly quick, and of course, it’s a Volvo estate so it has premium materials all over the cabin and a massive boot in the back. The V60 can operate in Pure, Hybrid and Power modes. Pure meaning electric only, which is ideal for your commute assuming you travel less than 31 miles. How much for all this Swedish glory? Prices start from £38,105. With prices starting from £70,800, the Range Rover Sport PHEV is the most expensive car on this list, and it’s also the heaviest, most well equipped and most luxurious. You’d think all that leather would hold the Sport PHEV back, but it still manages to return 31 miles of electric only range, which is quite impressive. So too is the claimed 101 miles per gallon, which would have seemed ludicrous 10 years ago, when all SUVs were branded ‘gas guzzlers’ but now it is very much a reality. As mentioned earlier, the Golf GTE isn’t available to order due to the unprecedented demand, which is understandable but a real shame for people keen to get behind the wheel of a powerful, futuristic hatchback. 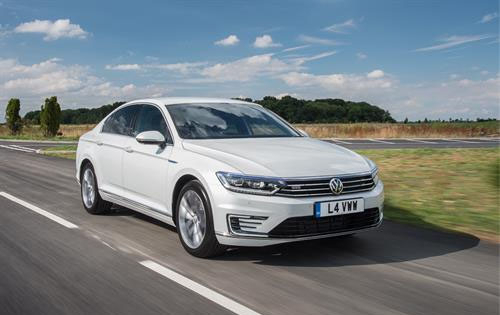 Interestingly, the Passat GTE uses the same powertrain as the Golf GTE and returns the same mpg and same amount of EV-only miles. The price is a little steeper, as you’d expect with it being a bigger car, with the entry level model starting from £34,930 - which is competitive alongside the few alternatives. At the end of January 2018, the Outlander PHEV smashed through the 100,000 sales target in Europe, far sooner than most of us would have anticipated prior to the vehicles launch. This is a plug-in hybrid that deserves every accolade that it gets, though. Reasonably priced, at just £34,805, it appeals to the masses and is an extremely easy to own hybrid for those who have never tried one before. The EV battery is good for 33 miles of electric only driving which is perfect for people in busy cities. Coming in at second place is the new KIA Optima. A large, comfortable saloon which is purpose built for tackling long motorway journeys and showing up in style. Priced from £33,995, the Optima might not have the same level of desirability as the German saloons, but it compensates for this with a high level of standard kit and an imperious driving style. Top of the league, and of no real surprise, is the recently improved Toyota Prius Plug-In Hybrid. There’s a good reason that these things are incredibly popular among private hire drivers. They’re roomy, comfortable and ridiculously economical. Prices start from £29,195 and for that you get a leading hybrid car which is full to the brim with impressive technology, and even once the battery is running low on juice, the regenerative braking will do its best to get you as close to 283mpg as possible.